I am an Artist, and also a Knifemaker. I hope to share on this new site just the artwork itself, and also video and photographic progress information for those who like to see how something is created. I have been an artist and a full time maker of knives and art my whole life, this has been my only job for more than 35 years. I have won many awards. I am a past member of the AKI (Artknife Invitational Group) for 10 years. My work has been published in magazines and books around the world, and my wife Dellana and myself had the honor of having a complete book of our art created about us by an author who has helped change the world of knife art through his books on knives, Dr, David Darom this book and information is in the media section of this site. If you would like to be added to my notification list of when new art and videos are posted, then leave a note in my contact page and you will be sent a notification email when new things are posted, which will be quite often. You will only receive emails pertaining to updates made on this site. I will also have a blog page on this site that will have short videos of many works as they happen. Many of the works you will be seeing here in the future will be fully mechanical art pieces. These pieces, whether they be knives or other creations, will all be physically interactive types of art. This is done to bring the emotional experience to a different level. This way the person interacting with the piece creates their own internal definition of the work, just by relating the feeling of the work to their own personal experiences. This gives people the ability to truely FEEL the art through every definition of the word. I.M.A. stands for Illusion Machine Art, and also stands for the origin of the knives - "I'm A Van Barnett". All of the Illusion knives are knives that are two or more things when viewed as a whole, but are also a complete knife and sheath. The idea is to create something that people can see as an art form no matter their background or the knowledge they have about knives. Then let them see the art in something they may never have looked at this way before. To me it is a way of sharing another art in the form of knives with a much larger group of people who love art but have never thought of knives as an art form. I am only working from a very small list now. I only commit to 4 knives a year. The list will be created the first part of each year, no long term list, 4 people each year. Names to purchase will be drawn from the compiled requests each year, these 4 knives and knives I have for sale at shows will be all. If you would like to be on this list email me and I will add your name to the list for the drawing. If a name is drawn and they do not wish to purchase that year another name will be drawn. This list is for knives only and it allows me to create and deliver knives within the year. There are no deposits so no funds change hands until a photo of the piece I have finished for the person on the list is sent. This also opens up the ability to create the very elaborate Illusion type knives. These pieces are very time consuming and expensive to create. So they are on slightly different time scale and will be created on a quarterly schedule with current progress photos and videos during the process. I no longer have a long list of orders because not to long ago I was more than 5 years behind (I am just now finishing the last of these) and was doing things that I no longer wanted to do. So now I only create what I want and the customer gets my best work! Which satisfies all involved - me for getting to be totally creative, and the collector for getting something totally unique. I've been making knives since 1979 and full time since 1981 - no other job all of my life, I enjoy creating physical interpretations of dreams no matter the medium, the true beauty is in the reaction others have to your art as they see it from there own perspective. All of the pieces in the Time Machine series are one of a kind. All parts are fused, soldered, riveted, and/or bolted together. Materials are brass, copper, bronze, silver, gold, glass, steel, and aluminum on some, and, my own Damascus. 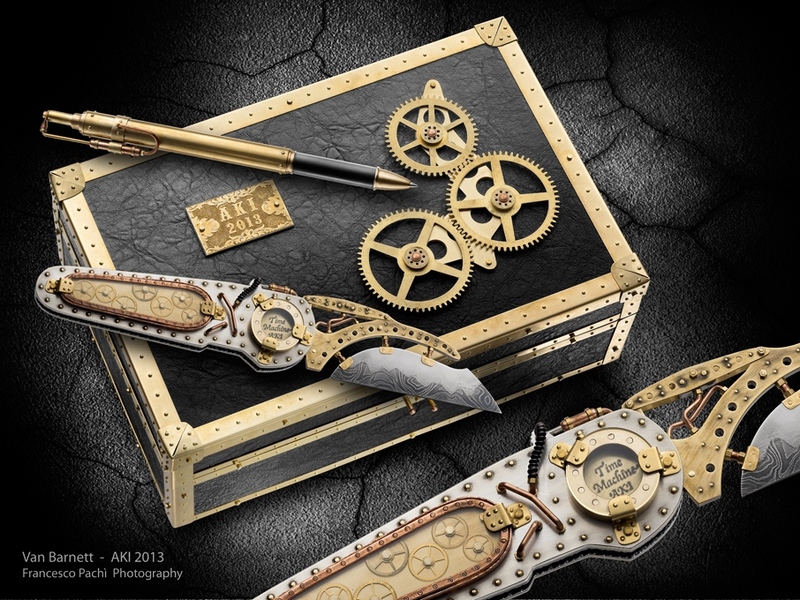 The Time Machine knives are designed to look as though they are from the 1890's industrial age, sort of an H.G.Wells/JulesVerne theme that takes you to a place that only you have been inside your mind, and they are also built to stand the test of time. Everything functions, all of the gears work and turn the irises open and close and there will be different things on all of these knives, as well as multiple pattern styles, and also unique locking mechanisms. All pieces will be distinctly one of a kind. There will be many new and/or different things from one piece to the next. It follows the time frame of inventing and creating new and different things. That's why I call them Time Machines because with dreams anything is possible. Much more to come on this site very soon! I have been asked a lot for information on how to do many things over the years, so starting this year.... I thought I would make information and knowledge from my years as a full time Artist/Knifemaker available to everyone. I will have videos, tutorials, and short how to's. Also, I will start doing the how-to demos after July. I will also be starting videos of the entire edited creation of each knife in this series so each purchaser will have a history of its making. I will be taking comments on what people would like to see created in the how-to section. Then I will do videos and/or photos of these processes. IMAVanBarnett@gmail.com or through my guestbook contact page.